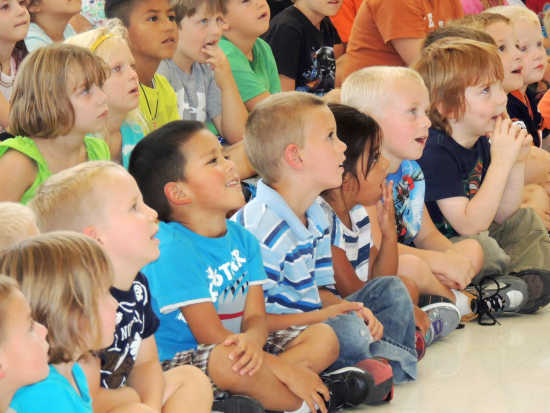 Using Sesame Street-type puppets and other props, McCook Elementary students were mesmerized by a puppet show Tuesday about bullying, presented by trained puppeteers with the Nebraska Elks Kids on the Block puppet troupe. Students learned what to do if they are bullied, if they see someone else being bullied and the power of words. There is also a difference between being a "tattle-tale," who wants to get someone else in trouble and telling a teacher to help someone else, students were told. Kids were encouraged to think before they speak, as "words hurt on the inside." The puppeteers also presented a program at Central Elementary. The Nebraska Elks Association, in conjunction with Kids on the Block, sponsors these programs at no cost to any school in the state of Nebraska.